Mountain rescuers have branded as "dangerous" the audacity of a driver who steered a 4x4 vehicle close to the summit of Snowdon. It is believed the Vauxhall was abandoned on Saturday morning as it may have become stuck on the descent - about 400 yards (365m) from the top. Ian Henderson from Llanberis Mountain Rescue says national park and emergency crews would never attempt the drive. Vehicles are not allowed on the mountain. "I'm incredibly surprised that anybody would have the audacity to take a vehicle up on the mountain that way," he told BBC Radio Wales. He said driving up "hugely steep", craggy and loose areas was dangerous, although he conceded that the driver had done well to climb so high. ...who's set up to deal with road traffic incidents on the top of Snowdon? Astonished walkers passing the Vauxhall Frontera have been taking photographs of the vehicle on the Llanberis side of the summit, close to the train track. 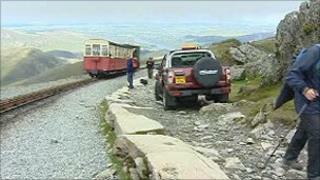 It is believed the driver could have used both the footpath as well as the tracks of Snowdon railway to make the ascent. It was spotted at about 08:00 BST by the driver a Snowdon Mountain Railway works train next to the rail line. Mr Henderson, the mountain rescue's team secretary, said: "There is a lot of conjecture with police at the moment to find out exactly what has gone on." But he added that if something had gone wrong, "who's set up to deal with road traffic incidents on the top of Snowdon?" He said he had not seen anything like it in his 18 years' work on Wales' highest mountain, whose summit is at 1,085m (3,560 ft). "And we have to look at how we are going to deal with this," he said although he hoped it can be removed "fairly sharpish". North Wales Police has confirmed it is investigating the incident. Jonathan Tyler, who has worked for the Snowdon Railway for the last seven years, said he had never seen a vehicle there before. "It's such a dangerous thing to do you would never see a 4x4 that far up," he explained.